Goat's Milk Liquid Soap has been the most difficult soap to make thus far if looking for a crystal clear soap. Goat's Milk has fat that must be accounted for in the lye calculations plus it has some unsaponifiables that you will have to deal with if using goat's milk in most quantities to get the benefits of the milk. After experiment after experiment, I have succumd to the fact that my goat's milk soap will not by crystal clear but I can do things to increase the clarity while maintaining the benefits that the goat's milk can bring to your liquid soap. The biggest challenge to using milk in liquid soap is accounting for the extra fat you will be adding to your soap. Fortunately Summerbee Meadow's advanced calculator has an option for goat milk fat - but you have to know how to calculate how much fat you will be adding. 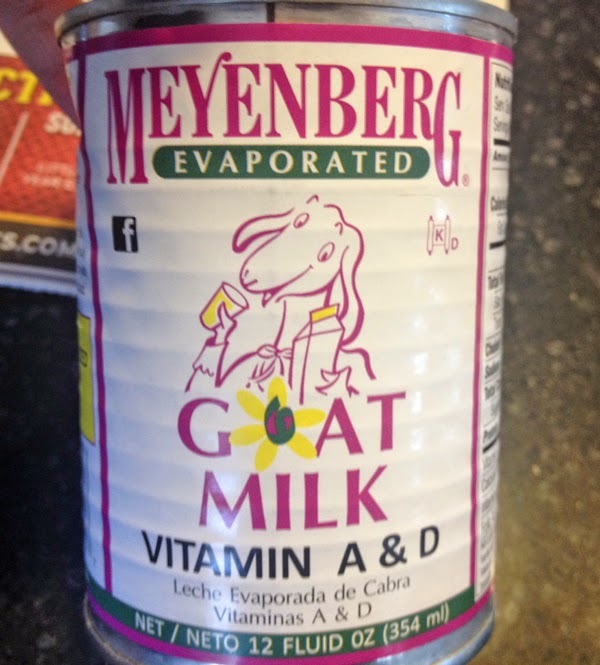 For this recipe I am using 5 ounces of canned Meyenberg Goat Milk. Each ounce of this goat milk has 2 grams of fat so my 5 ounces will have 10 grams of fat. Convert that to ounces (since that is the only measurement you can use in SummerbeeMeadow's Calculator) and I will be adding .35 ounces of goat milk fat. 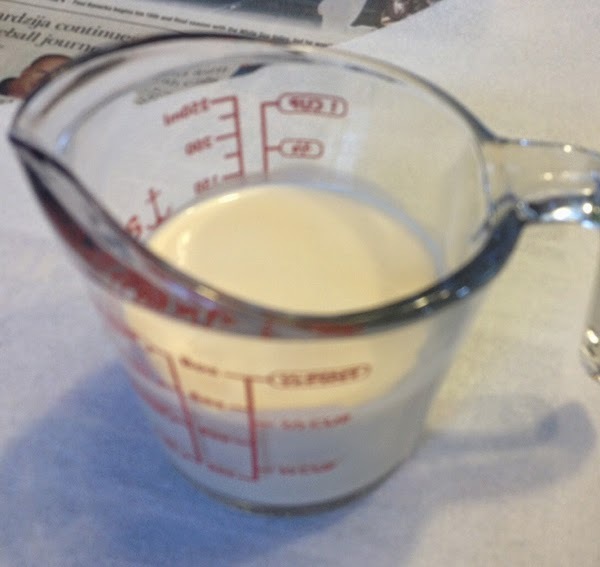 So, when I add in the oils I am going to use into the calculator, I am also going to add .35 ounces of goat milk fat. 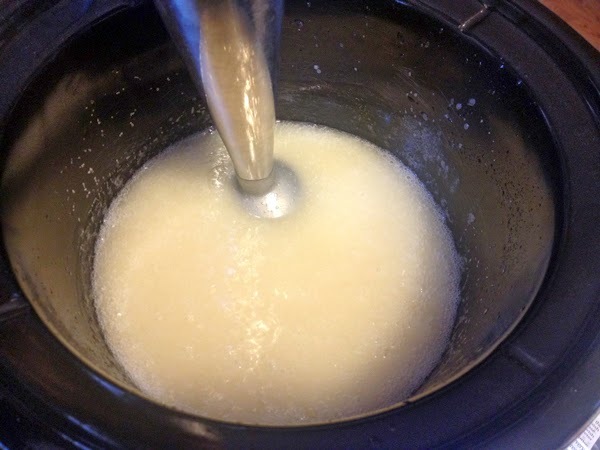 Since this is a more complicated method, I suggest that if you have never made liquid soap before, you start with a simple formulation to understand the process and all the stages your soap paste/paste dilution will go through before it is done. Please be sure to follow all safety precautions when making liquid soap including gloves and safety glasses. You are working with caustic materials - safety first. This recipe is not only using goat's milk, but also both potassium and sodium hydroxides. I like to use both lyes as I feel it gives soap a bit more body. It also gives a bit more thickening when working with high olive oil content liquid soaps. I will be using the summerbeemeadow calculator as it account for the 10% impurity in KOH and adjusts for it calculating only a small excess of lye and it allow for the calculations of both lyes. I have also included just KOH amounts for those who prefer to do a single lye liquid soap. Both are calculated with a 0% superfat. So, here we go. Since this is not a beginner formula it is assumed the the appropriate equipment and tools are already on hand. Please use all safety precautions including wearing eye and hand protection, long sleeves, long pants and closed toed shoes. Both Sodium Hydroxide and Potassium Hydroxide are caustic materials which will burn if they come into contact with your skin or eyes and can do some serious damage. Not something to scare you away, but always take appropriate safety measures when making soap from scratch. 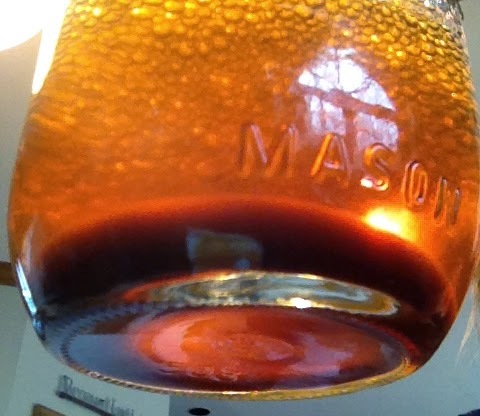 Dilution Water - I typically start my dilution at a ratio of 1:1 between paste and boiled distilled water. Then slowly add additional boiled distilled water in smaller increments until the soap is fully diluted. Take notes so that the next time you create the same formula, you have a good idea of how much dilution water you will need. 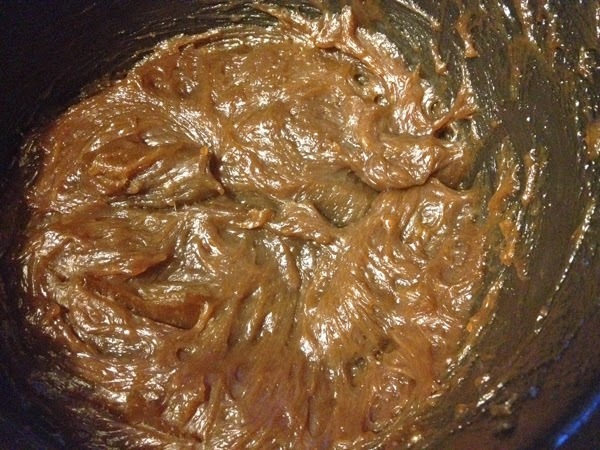 Patience is needed to allow the paste to fully dissolve into the water. 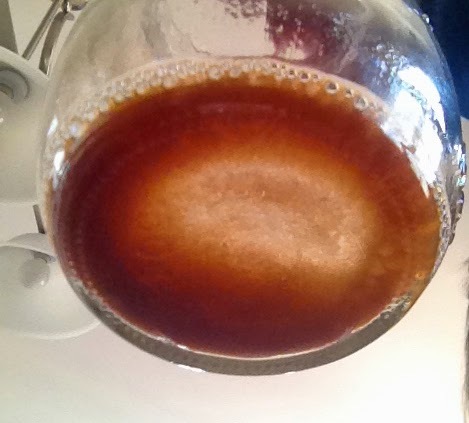 I do not use a lot of heat for dilution - the warm setting of the crock pot if needed. I don't like to post an exact amount of dilution water needed because there are many factors that go into the amount you will need. These include: how much water was used up front, how much water loss during the cook, how much glycerin was used in the initial lye mixture and how concentrated one likes their finished soap to be. I find that the percentages of potassium and sodium hydroxides can also influence the amount of dilution water needed. My formulas will dilute anywhere from a 1:1 ratio to a 1:4 ratio. Please note, this formula does not have a lye excess so there is no need to use any neutralizing agents (borax, citric acid or boric acid). All the available lye will be used to saponify the oils - no excess lye, no need to neutralize it. Now you can omit the glycerin and use 7.6 ounces distilled water only. 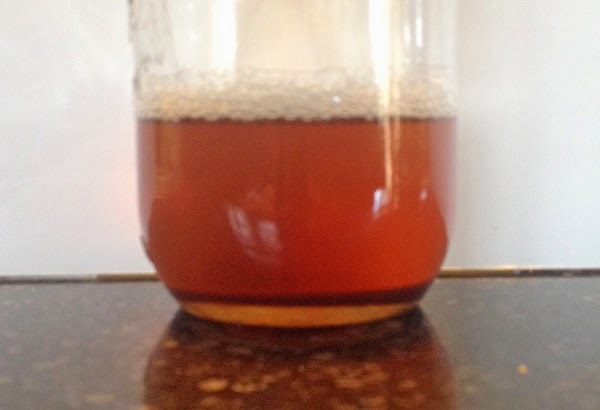 The added glycerin will speed up the process a bit and you may want to go a bit slower at first. Just make sure that your water amount is at least 1.1 x your combined hydroxides. This is my rule of thumb, you can play around with amounts of water and glycerin that work for your you. Summerbee Meadow will calculate your liquid at about 3 X your hydroxide weights, other calculators will compute lower amounts. The more liquid, the longer it takes to trace. 1. Measure out your chilled goat's milk and set aside. 2. Measure out your oils and heat to melt. Heat to about 160 degrees F.
3. Measure out your distilled water and lyes. Add your Potassium Hydroxide to your water to dissolve, then add your Sodium Hydroxide. 4. Once dissolved, slowly add your glycerin to the lye/water solution if using glycerin. The water/lye solution is hot enough to heat the glycerin and make it more fluid. 5. Add your lye to your oils to incorporate. 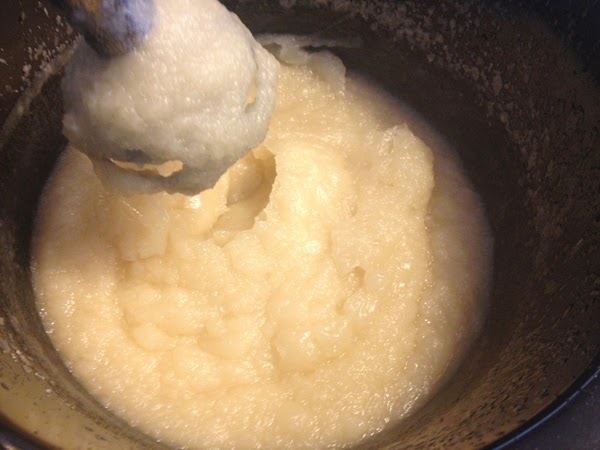 You will take this mixture to trace before adding your goat's milk. You can really add your goat's milk at any point after the oils/lye mixture has homogenized and no longer separating out, but I usually wait till trace. You have to be careful though not to wait too long. 6. 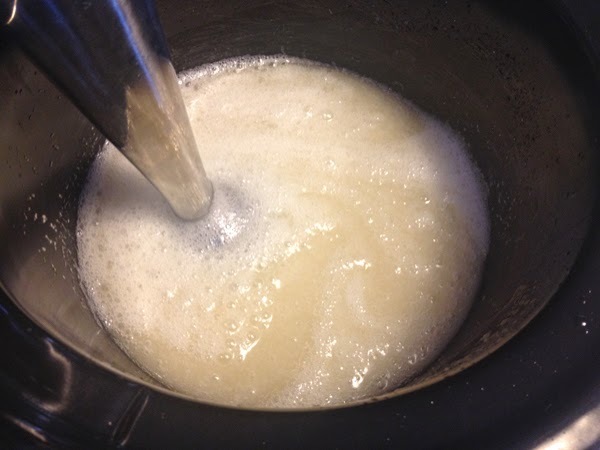 Stick blend you soap paste mixture as it goes through the stages of making liquid soap paste. 7. This is about the stage that I will not add the cold goat's milk. 8. You will notice that your soap paste will darken due to the addition of the goat's milk. 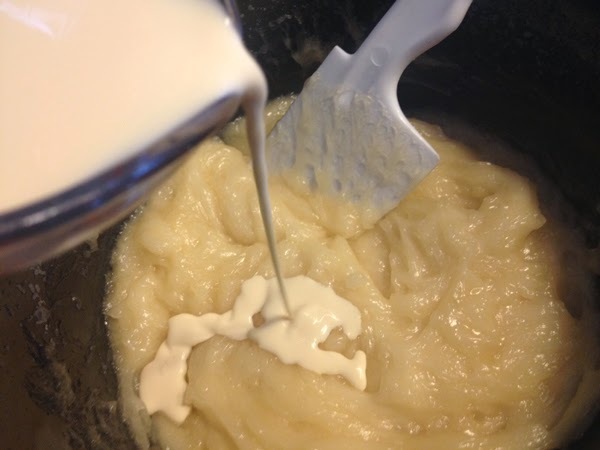 Keep mixing until the goat's milk has incorporated into your paste. 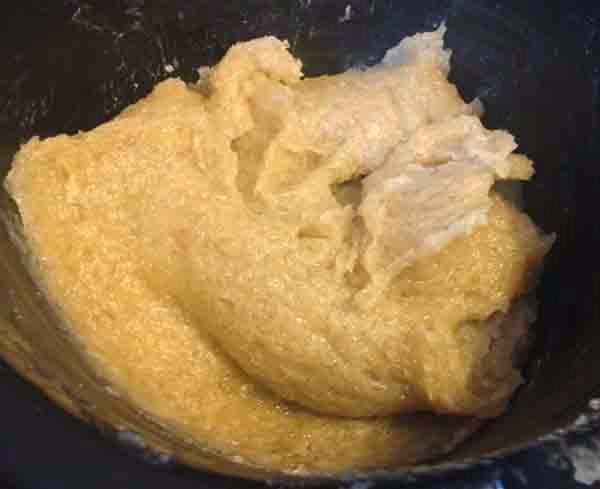 Your paste will thin out a bit since you are adding a liquid to it at this point. 9. At this point my goat's milk is incorporated and the paste is very thick and stiff. So I will start the cook. My crock pot is on low which will still cook at 160 - 180 degrees F. If I sense it is burning due to the sugars in the goat's milk, I will alternate turning it on warm, low to try to not overheat it. I will test my paste with phenolphthalein drops throughout. This soap paste will test clear with the drops within 1 - 2 hours but I continue to cook to increase the clarity. 10. After about 6 hours or so (I cook this a bit longer due to the alternating temps to keep it from burning). I have a nice dark, creamy, glossy paste. There is no hard and fast rule for cooking your paste. Some people cook for 3 hours, some cook for 9 hours. 11. Clarity test - it is a bit cloudy, but I expect that. 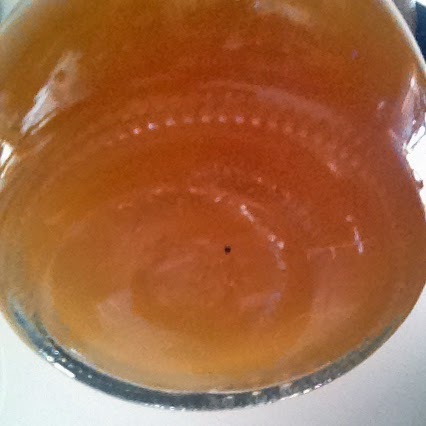 You can also see the sediment that is accumulating on the bottom. That is normal and will be filtered out. Milk soaps are known for creating a sludge or sediment that falls to the bottom. 12. Let the soap paste sit overnight to cool down and complete the process. This is a sample the next day. You can see the layer of sediment that has accumulated on the bottom. 13. I test the Ph of my soap and it is 9.5. 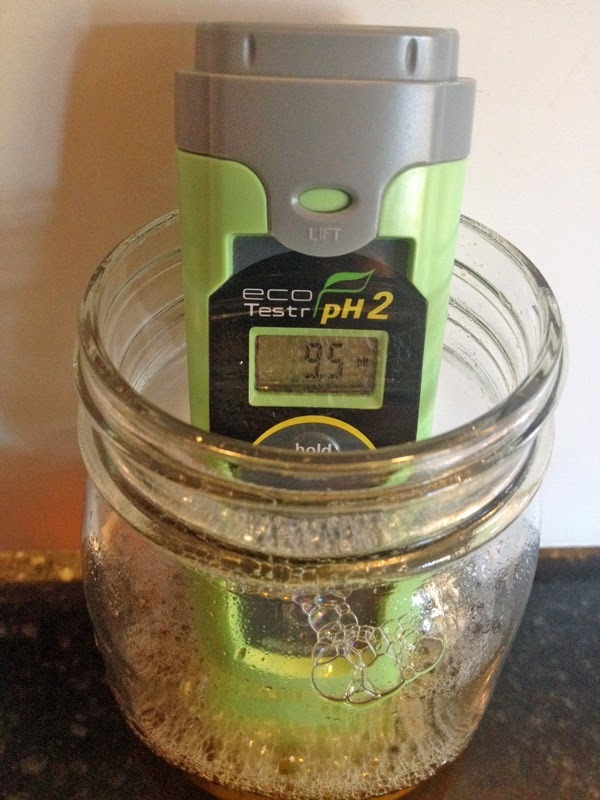 I will not adjust this as it is not unusual for ph to naturally lower a bit as the soap sequesters and gets milder. Measure your ph on cooled room temperature soap for the most accurate reading. Hot soap will register a lower ph value than when it is at room temperature. 14. 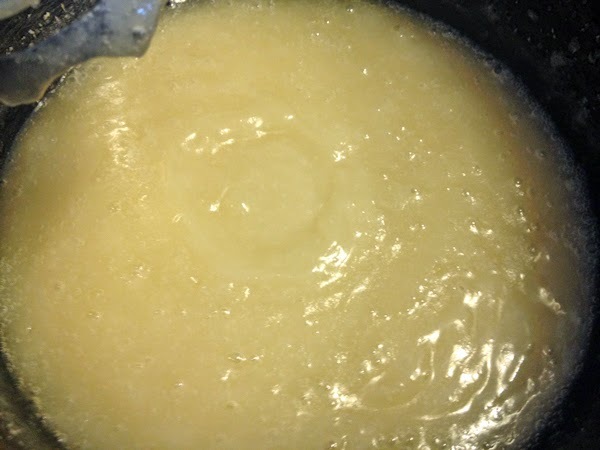 Dilute your remaining paste or a portion of your paste (you do not need to dilute it all at one time - whatever paste you do not dilute, place in a ziploc bag, label it and store in the fridge) using boiled distilled water. I start with a 1:1 ratio and add additional boiled distilled water as needed in smaller increments. You do not want to over dilute your soap - patience is key and everyone has their own soap concentrations preferences. Keep in mind, the more coconut oil in your formula, the less water needed to dilute, the more olive oil, more water is needed to fully dilute. The remaining steps are being shown with just a small sample of this soap. 15. Now, we do not want this sediment in our finished soap so we will filter it out with a fine mesh strainer and paper towels. Take the strainer and place it over a clean container to hold your strained soap. 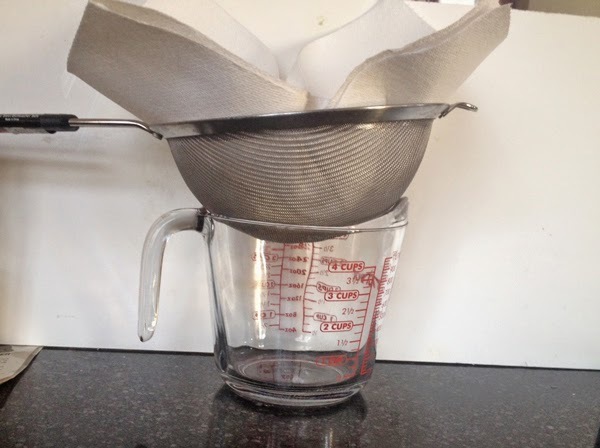 Place 2 - 3 layers of paper towels in the strainers. 16. 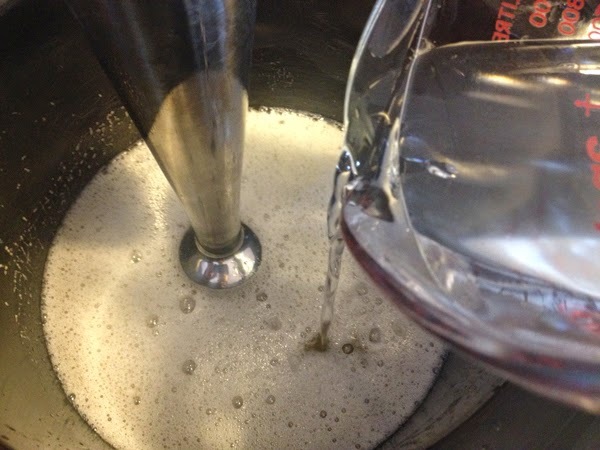 Pour your liquid soap into the paper towels to strain out the sediment. 17. I did not pour all of the soap through the strainer as the sediment in the bottom was pretty heavy and this was just a small sample. This is what remained in my sample soap jar. 18. 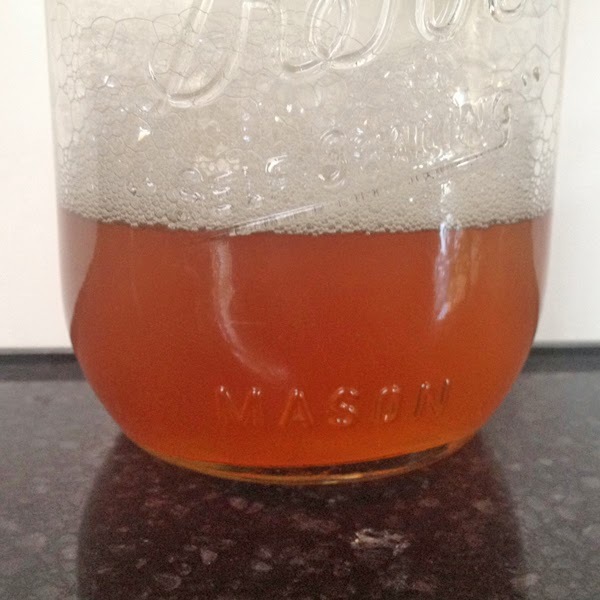 Pour your strained soap into a jar/container for sequestering. You can add your sequestering agents (glycerin for example) at this time. 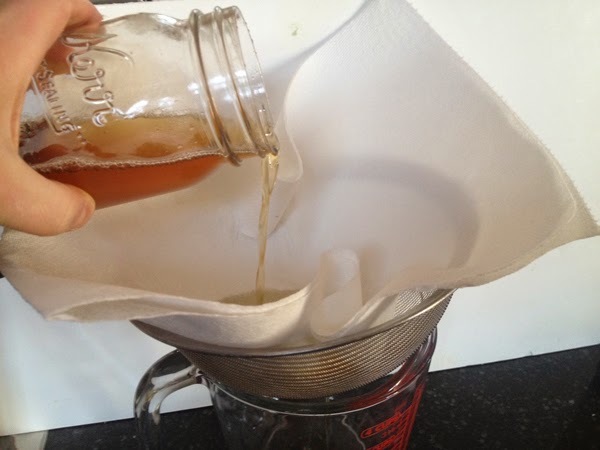 If you did not use enough paper towels, you can easily repeat the straining process. 19. The strained liquid goat's milk soap ready to sequester. You can see that it is not perfectly clear where you can see through it - but still looks good. 20. You soap can now sequester for as long as you like then thicken and fragrance. Goat's milk soap seems to have a natural scent that is slightly different than unscented liquid soaps not using goat's milk. That may be due to the sugars being cooked in the goat's milk. Some people really like this natural scent. 21. Here is the finished soap from diluting the full batch of paste - bottled up and ready to go. 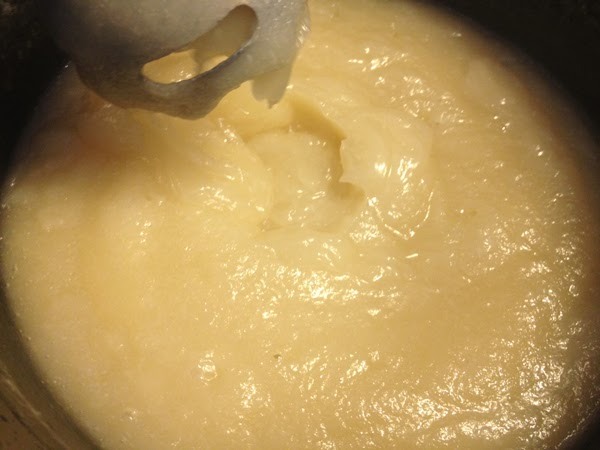 I added glycerin and water soluble shea butter at 1 ounce per pound of finished soap and thickened it with HPMC. It is scented with a combination of lavender, lime and peppermint essential oils at about 1% of the total weight of the diluted soap. Very detailed blog post, awesome work =) I love GM soap. Hi Renae - you could add the powder goat's milk to your lye water. I am not sure how much to use as I have never used powdered goat's milk and you need to know the concentration of the powder. Knowing how many ounces of powder/ounces of water would help you make this determination. I looked on Meyenberg's website to see what the milk fat was for diluted GM from their powder. I forget now what it was but my mind wants to say 7 grams(?) and the soap turned out beautifully. I have adopted this method for all my milk soaps now. Thanks Faith for the great tut! Thank you sooo much for sharing this tutorial! I'm about to give liquid soap making with goat's milk a try, am extremely excited about it, and will definitely be referring to this tutorial when doing it. My question has to do with neutralization. I didn't see any reference to that step in the tutorial. Have you found that when goat's milk is used that you don't have to neutralize with boric acid, borax, or citric acid solutions? Hi there - no, I do not neutralize (remove any excess lye) with this or any formula as I do not use a lye excess when creating liquid soaps. I find that you can superfat your formulas from 0 - 3% and still get a clear soap with no need to neutralize since there is no excess lye remaining in your soap. 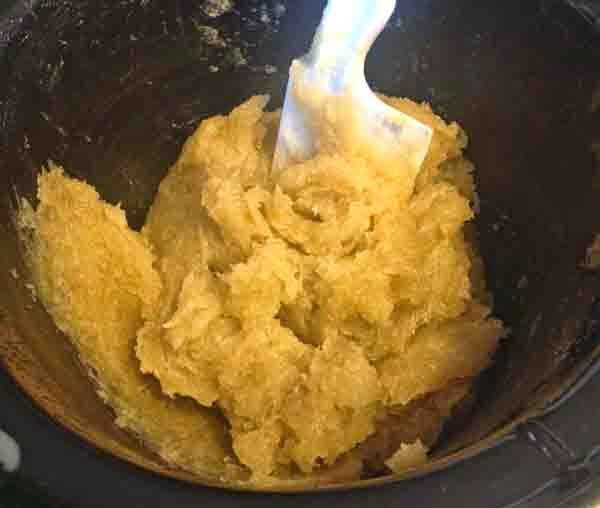 Improvements in the lye calculators we currently have access to and improved knowledge of liquid soap allow us to create formulations that take into account the 90% purity of KOH and therefore, no need to use a lye excess to account for this. Hello, this is going to be my first time making liquid soap. When it gels how much do you take out to make a jar. After its dark brown do you add water then or add the paste to cool in a jar because your looks loose in the jar not like the past in the pot. How much Glycerin do I put in and do I add water at the end. first. Start small and learn the techniques and stages a soap paste will go through first before adding other elements (glycerin, milks, dual lyes) to the process. It makes troubleshooting your soap easier too. 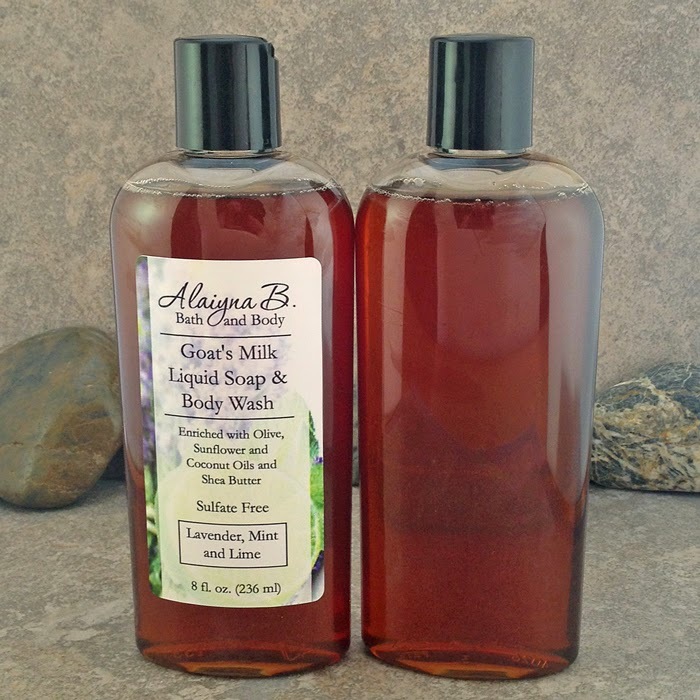 love your sharing your talents, been hearing about the dual lye liquid soap. so this will be a new experience. Great tutorial. Thank you so very much. Have wondered about the dual lye, Am now confident to give it a try. Thank you for the great post! I am looking for a recipe for a liquid goat milk soap that is pearly or milky white... do you know of any or can I modify the above recipe? Thanks! 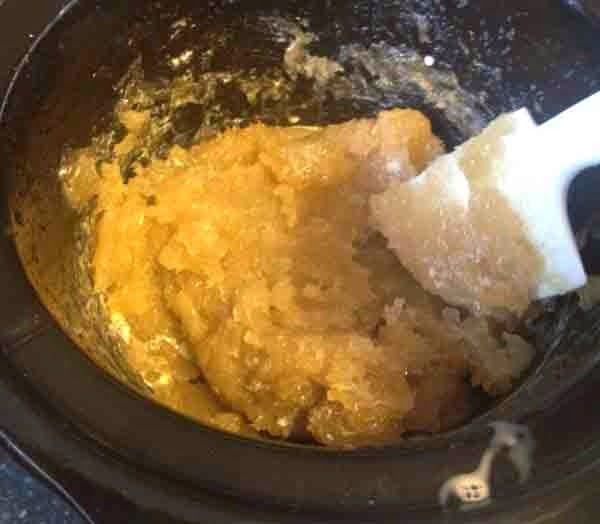 Some people will use oils and butters high in stearic or palmatic acids (palm oil, stearic acid, lard, tallow, shea butter, cocoa butter, etc.) in high percentages and end up with an opaque soap. You can also use a product called glycol distearate or glycol stearate (I use it at 3% of diluted soap weight) to opacify your soap. I find that using animal fats also gives you soap a pearly effect depending on the amounts used. I have fresh pasteurized goats milk that I use in my cp soaps, will I apply the same ratio of the goats milk as the canned goats milk? And would I have to know the fat content of the fresh milk? Love your tutorial and can't wait to give it a try. I am so glad I came upon your blog!! I have been making liquid soap for about 4 years, and have wanted to try making some with goat's milk for a long time, so thank you soooo much for sharing!! It all makes perfect sense, but I have one question, where can I find water soluble shea butter? I am very intrigued with that, as I have never heard of it! Does it superfat as well, or just help with the clarity? Thanks so much!! Such a great tutorial. Thank you so much for sharing. Yes, I was wondering about adding a preservative to this soap. Does it need one added? Will it hurt to add if I just wanted to. thanks for sharing. You will find many differing opinions regarding preservatives in liquid soap. Some people believe that the pH is high enough to inhibit the growth of bacteria, yeast and mold yet it is also known that some bacteria can grow in high pH products. Any time you add ingredients/additives that can be considered "bug" food (food products, proteins, botanicals, etc.) you run a higher risk of a bacteria, yeast or mold developing in your soap. If you choose to add a preservative, you need to make sure it is one that can handle the high pH of liquid soap - most are not effective over a pH of 8 which liquid soap will always be. There are very few out there (suttocide A is one) AND the amount of preservative you use is based on your completely diluted soap at usage rates specified by the manufacturer. I'm wondering how much liquid soap this recipe makes. I'm trying to plan how much I will need to make for Christmas gifts this year and how much of each ingredient I will need a. Your total batch output will really depend on your dilution ratio - how much distilled water you add to go from paste to soap. If you have sediment and need to strain it out, you will also lose a bit of the finished soap in that process - not a lot, but some. I would say start with the above batch and see what you end up with. Thanks so much! I can't wait to try this. I've been making CP soap for 21 years and just started liquid soap. I really want to do goat's milk, but couldn't find a good recipe. Most are just grating bar soap and adding water. Your tutorial is detailed and very well written. Thanks again! Was wondering your thoughts on eliminating the distilled water and just using goat's milk for the total liquid. I have made 2 batches now, following your recipe with just the potassium hydroxide. First batch I didn't mix to a paste, just to like a real thick pudding. It never got any thicker after about 6 hours in double boiler. 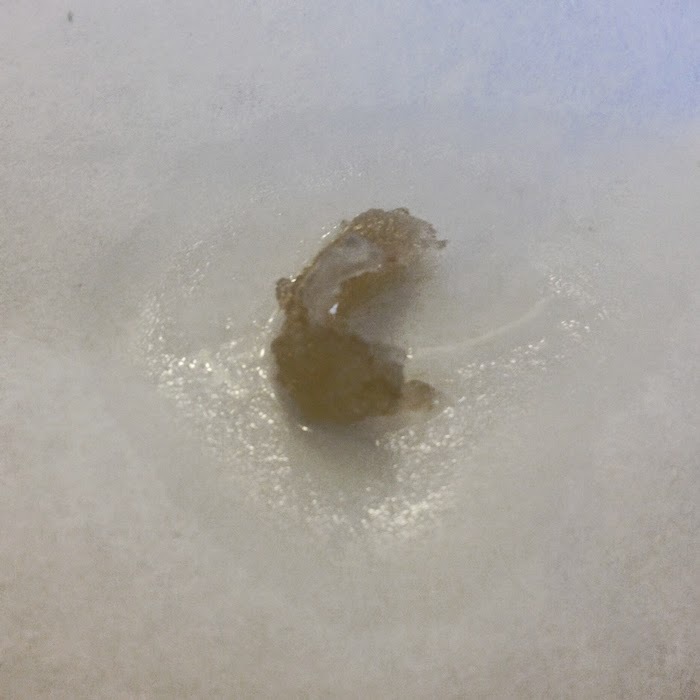 After diluting, I did do a borax neutralizer. After sequestering for 2 weeks, I had about 3 inches of a light creamy top layer, and the clear brown on the bottom half of each jar. I have the second batch cooking now, and made sure the batch was thick and pasty before cooking. After almost 3 hours, it has thinned out somewhat like the last batch. Not sure if there is something I am doing wrong. Since I do not do borax for a neutralizer (too much borax will cause definite problems with your finished soap) it is difficult for me to know what could have happened. If you do not have a lye excess, you do not need to neutralize. I have tried this several times and I don't know what I am doing wrong. It turns out like a solid mass not a paste and is a nightmare to dilute, I have to mash the solid paste into the water. Any sugestions? 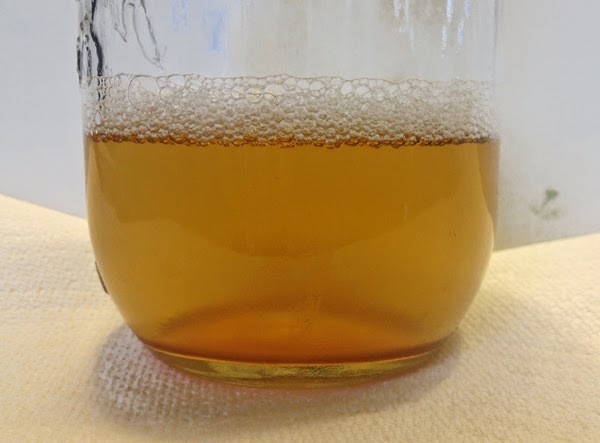 Is there a curing period when making liquid soap like bar soap? Theoretically no as it is a hot process method so saponificaion is complete once the cook is done and you have no excess lye. There is no water to evaporate out either as is another reason for curing cold process soap. However, many people think that the soap becomes milder over time. Also, it is a good idea to allow the finished soap to sit for a bit to allow any unsaponifiables to settle out of solution. Hi, I was finally able to make this soap, and my family loves it! It's a bit tough on our hands once the weather gets cold, and I would like to add the water soluble Shea to it, but I've never been able to find any. Do you mind sharing where you have found It? Thanks! !